On an Oriental workshop, a few years ago, I learned about Larb Gai, a very popular dish in Thailand. This spicy oriental chicken salad is since surely one of my favorites and returns regularly in various ways back to our table. This Thai dish is packed with flavor, healthy and very photogenic. You can add anything, for example avocado, grated carrot, bean sprouts, mint, basil, peanuts and so on. I used the new extra fragrant basmati rice from Lassie to make the ‘roasted rice’. This part of the dish provides a tasty bite. Have you ever tried it? Roasting rice is really simple. Roast the raw rice in a frying pan (without oil) until it begins to color. 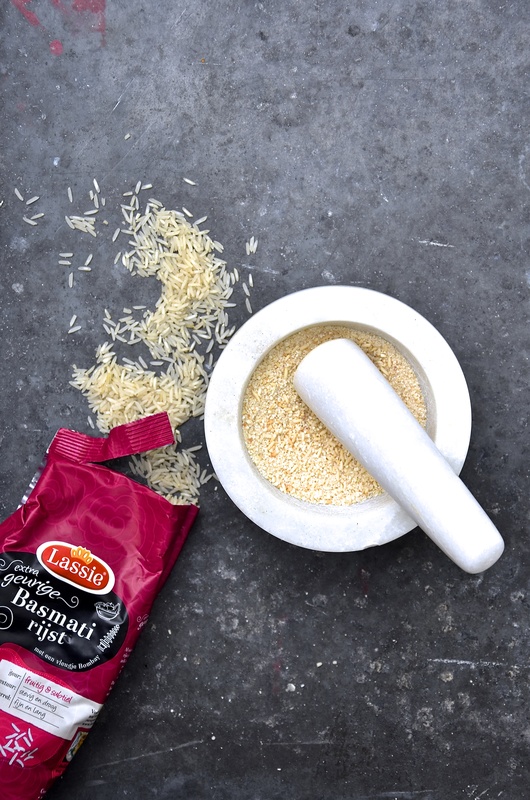 Grind the rice in a mortar and you have a delicious crunch of extra fragrant basmati rice! Roasted Rice Crunch: heat a frying pan or wok over high heat and add the rice (without oil), roast the rice until it begins to color. Let the rice cool a bit and grind the rice in a mortar. Heat a frying pan or wok and add the minced chicken and a little water, cook the chicken. Meanwhile, mix the garlic, shallots, spring onions, coriander and cucumber. Spoon the hot chicken mixture in a separate bowl and season with a dash of fish sauce, lime juice and chili flakes. Add the cucumber mixture. 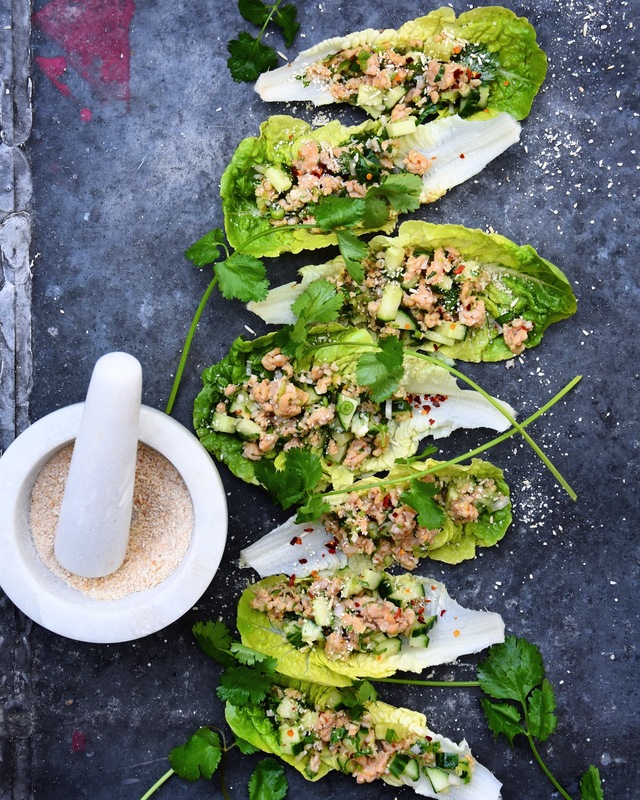 Serve in little gem ‘bowls’ and sprinkle basmati rice crunch on top.